분홍색 시복을 입고 화문석에 앉아있는 좌안팔분면 좌상으로, 얼굴은 약간 화면의 좌측으로 치우쳤고 눈을 아래로 깔고 명상에 잠겨있는 듯한 인상을 준다. 의복은 담묵의 주름선 언저리에 명암이 가해져 있으며, 가슴 부분에서 살짝 아래로 휘어져 복부의 입체감을 암시하고 있다. 허리에는 삽대를 차고 있는데 가운데 부분을 금박으로 처리했다. 인물이 방석 위에 표범가죽을 깔고 앉아 있는 점이 주목된다. 현재 그림 속의 주인공이 누구인지는 알 수 없으나, 전체적으로 매우 섬세하고 정교할 뿐 아니라 인물의 품성까지 잘 드러내주는 수작이다. 18세기 후반 초상화의 특징을 잘 보여줌과 아울러 원래 표장상태를 잘 유지하고 있는 작품이다. This nameless scholar’s portrait shows remarkable skill in conveying the subject’s inner character through the delicate expression on his face and downcast eyes. 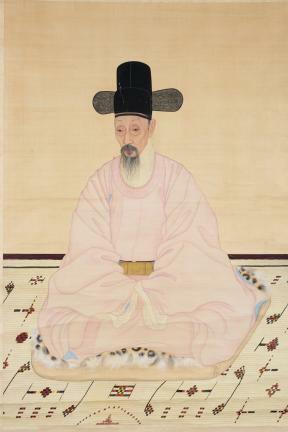 The old scholar is dressed in a pink everyday robe and seated on a decorative rush mat, in a four-fifths view from left. The folds of the robe are expressed with light ink lines accompanied by thin color washes. The vertical seams running down from the chest are slightly bent to suggest plumpness around the abdomen. It is noteworthy that the man sits on a cushion covered with a tiger skin. This is considered to be an outstanding work successfully representing the portrait style of the late 18th century. The scroll mounting is also preserved in its original condition.